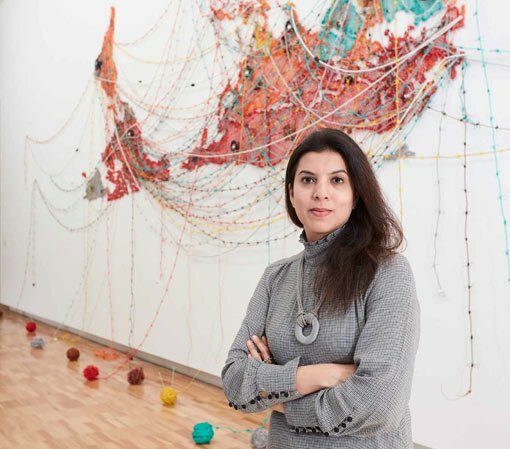 Reena Saini Kallat presents ideas of movement, displacement and change in her work Woven Chronicle , created specifically for the Art Gallery of NSW for Fearless: contemporary South Asian art , the Gallery’s first-ever exhibition of the work of South Asian women artists. 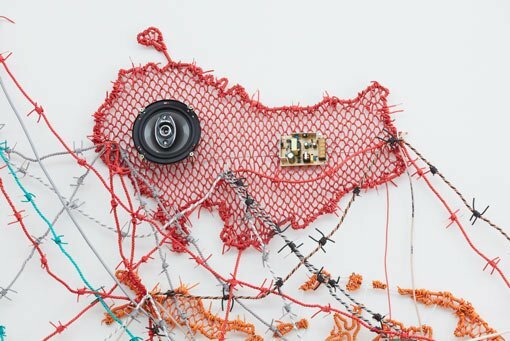 Made from plastic-coated cabling and visually referencing barbed wire, the installation traces migration routes taken by groups of people, from indentured labourers to professionals. It has been acquired for the Gallery collection. You’ve made other works in your Woven Chronicle series of world maps, but here you’ve flipped the map, placing the antipodes at the top. Why did you do this? All maps are distortions of sorts. There is no real up or down because the world is obviously round. Since Mercator drew a cylindrical world map in 1569, that has been the most familiar projection of the world. My interest is in how maps represent us – not just how we shape maps, but how maps shape our understanding of the world. Egyptians made east-up maps because the sun rises in the east. Islamic maps are always south-up because most of the countries are to the north of Mecca and they prefer to situate Mecca at the top. When he was 12, Australian schoolboy Stuart McArthur drew his first south-up map, placing Australia towards the top of the globe, and he was reproached for doing that. As a university student, he decided to print these reversed world maps. When I was reading about him, I thought, ‘Oh how appropriate to make my map that way for the Art Gallery of NSW’. I also like how unfamiliar this projection is, and so much that is unfamiliar unnerves or disconcerts us. Textiles – particularly weaving and knitting – is an art form that has, historically, often been associated with women makers. Are the electrical wires that are woven together to form your maps partly referencing this history? The first map I made was in 2011 for the Göteborg International Biennial for Contemporary Art. I was responding to John Milton’s essay ‘Paradise lost’. Milton was interested in how trade across oceans would change the world. I began to think of yarn, a product that has travelled from India to so many different countries. I didn’t quite want to work with yarn, but I kept thinking of materials that I could treat like yarn to evoke that colonial connection. The idea of electric cable occurred to me as something that is a transmitter: the fibre that connects the world. In my maps, it morphs into these barbed wires and fences and holds these inherent contradictions of being a conduit, a carrier and a barrier at the same time, which seems to me to reflect a dilemma of our times. I was also thinking about the earliest human migrations in Africa, of climate change, of agricultural societies, of industrial and post-industrial worlds. I wanted to somehow make a map that suggested those motions of labour within the making of the piece itself, and weaving does that. I am attempting to evoke textile, to evoke knitting, but it’s also supposed to be deceptive, in the sense that it appears to look like it’s made of yarn, but it isn’t. You touched on another theme of the work: globalisation and all its paradoxes – opportunity for some, disadvantage for others, it offers an unprecedented connectedness between countries, together with a growing friction between the world’s cultures. How do you tease apart all this to make a coherent work? The maps have come to mean different things as the progress of time gives them new context. It’s different contemplating the work today – given Syria and the global refugee crises – than it was in 2011, when I made the first work for Gothenburg. At that time, we were reflecting on a world coming through an economic crisis. Today we are facing different problems, but the maps seem to capture them just as well. 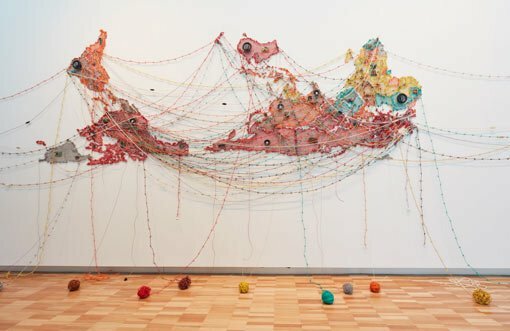 The work is so much about borders and barriers, and how fraught these imaginary lines can be. When you think about the world today, those national borders are going to disappear and yet there is this rise of nationalism, so to speak. It’s prickly and discomforting. So, the focus of the work, when it comes down to it, is in the line – lines that simultaneously connect and disconnect us. Your Woven Chronicle maps have been shown all around the world. How have different audiences responded? When the Vancouver Art Gallery commissioned a map for an outdoor space, I didn’t really think that it could work. I felt that it was too delicate and fragile looking, and how would it stand outdoors? And I was proven wrong. Vancouver being a migrant city, the people there were so excited to look at a work that speaks about the story of human migration – their story. And being outside of a traditional gallery space, they were not so intimidated. They can point and say, ‘Oh, that’s where we came from’, ‘Oh, this link is missing’. It’s a work that’s universal and personal at the same time and I hope that people sense that connection. On the other hand, the work I did for MoMA was against a deep blue wall – which completely altered how it looked. I was a bit taken aback by that wall at first. It’s not like the work is hung in the sense that the wall is almost a part of the world. But I think this colour worked beautifully in the end. I love that in each place I make these works the curator brings so much to it – in terms of how they see it and how they see visitors relating to it. This collaborative aspect is very much in the spirit of the work itself. A version of this article first appeared in Look – the Gallery’s members magazine.